11 Luxurious Gold Bedding Sets! 11 Luxurious Gold Comforters and Bedding Sets! Gold is associated with wealth, success, elegance, prosperity, glamour and power! 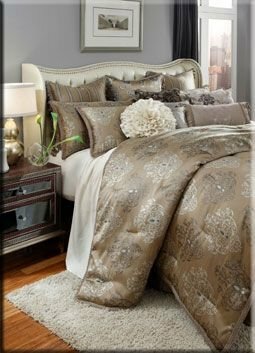 If you want to create a beautiful and luxurious bedroom for you and your husband, I think you are going to love my selections of gold bedding sets on this page! Each one is more stunning and fancy looking than the next! Gold is such a gorgeous color! 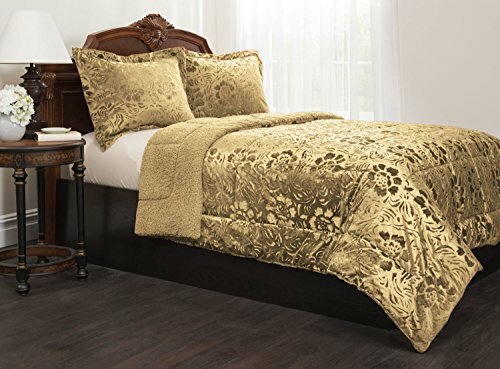 *This is a stunning 13-piece gold and brown king size comforter set for sale! Stunning Gold and Brown Comforter Set! This is a stunning gold and brown 10-piece comforter set in a gorgeous floral design in embroidered velvet! 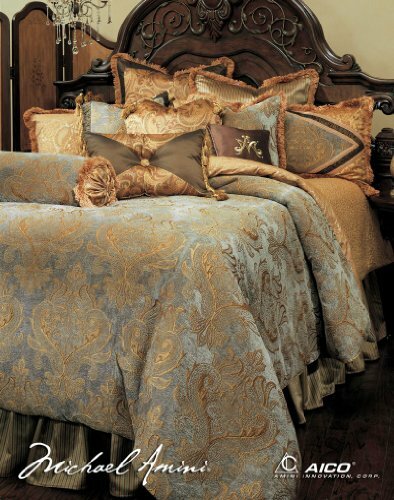 It is one of the most beautiful gold comforter sets around! Look at all the gorgeous, fancy pillows! And the fancy bed skirt! This is a very cute, feminine and sophisticated 13-piece gold and beige king size comforter set for sale! It will definitely match your beige or off-white walls, rug and curtains! It comes with six decorative pillows, three Euro shams, two king shams, one bed skirt and the gorgeous gold comforter! 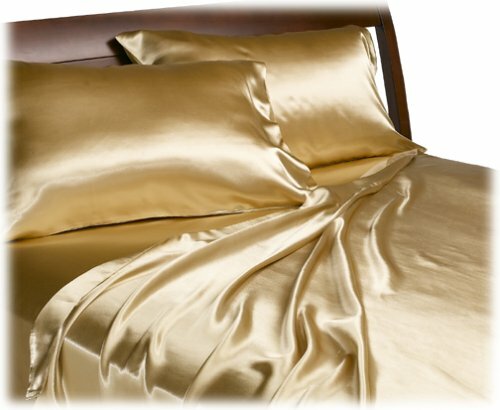 Affordable GOLD Satin Queen Sheet Set for Sale! If you are looking for beautiful (and affordable) gold sheets and gold pillow cases for your bed I think these are the ones! They are very smooth and soft to sleep on! This is one of the softest, warmest, cutest and most affordable gold comforter sets being sold right now! How beautiful is the floral design all over? I LOVE this beautiful gold tone! Not too light, more on the darker side, but not too dark either! You will also get the gorgeous matching gold floral pillow shams! Very Beautiful 5-piece GOLD Wedding Bedding Bedspread! This is definitely one of the most beautiful and feminine gold bedding sets from here! Look at all the ruffles and flower designs! If you are looking for a beautiful solid gold bedding set for your bedroom today, I think you are going to enjoy this one! It is a 3-piece king size gold silk bedding set for sale! As you can see the color is very shiny! Egyptian Cotton 800 Thread Count Solid Sateen 4 Pc Comforter Set – Gold King. This is a beautiful, unique and very elegant solid yellow gold Egyptian cotton king size bedding set for sale! It is amazingly soft and luxurious! Another classy and very beautiful gold comforter set for sale! It is a 7-piece set that includes the bed skirt, pillow shams, Euro shams and decorative pillow, just like in the picture. Will make your bedroom look very sophisticated! 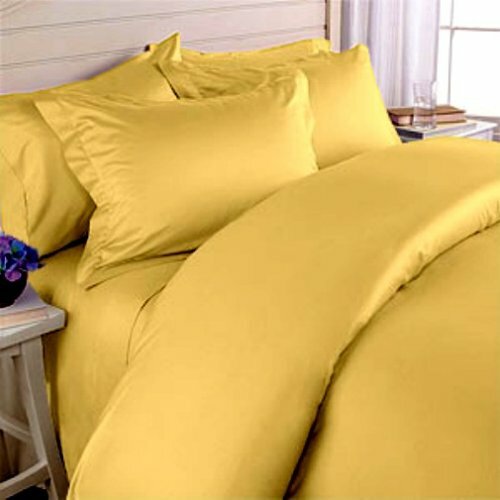 This is a high-quality, lovely solid yellow gold 100% pure mulberry silk duvet cover set! Perfect bedding set for people with allergies! Very soft and comfy as well! Stunning GOLD Asian Bedding with Dragon and Phoenix Bird Embroidery! And I will leave you here today with one of the most unique and absolutely gorgeous gold bedding sets ever created! It’s a stunning Asian bedding set with a beautiful dragon and Phoenix bird embroidered design on a silky shiny GOLD background! It also comes with the gorgeous gold embroidered pillow shams as well and one flat sheet. Beautiful SILVER Bedding Sets for Sale! Soft Satin Comforters and Bedding Sets!